In about 1 hour yesterday I converted the handlebars on my old 10 speed to something a little more comfortable. It’s the first time I’ve swapped components on a working bike so I was a bit nervous about not having a bike to ride by the end! Here’s what I was working with. My old Raleigh 10 speed from who knows what era. I had a shifter lever break off and I’ve been running it as a 5 speed. It’s been doing a great job all summer. The road tires mean a very efficient ride which I love. But the drop bars are starting to bug me and I got the itch to be a little more comfortable on my commute. I tossed around the idea of a new hybrid bike, but I wasn’t sure I wanted to give up the road bike styling – I do like to go for fitness rides too and I wasn’t sure how a 50 – 100k would go on a hybrid. Instead, I decided mod the old 10 speed to make it more comfortable. I removed the drop bars and replaced them with a mountain bike flat bar that I had from another donor bike. There was one hitch that had me running out to get parts though midway through the modification. 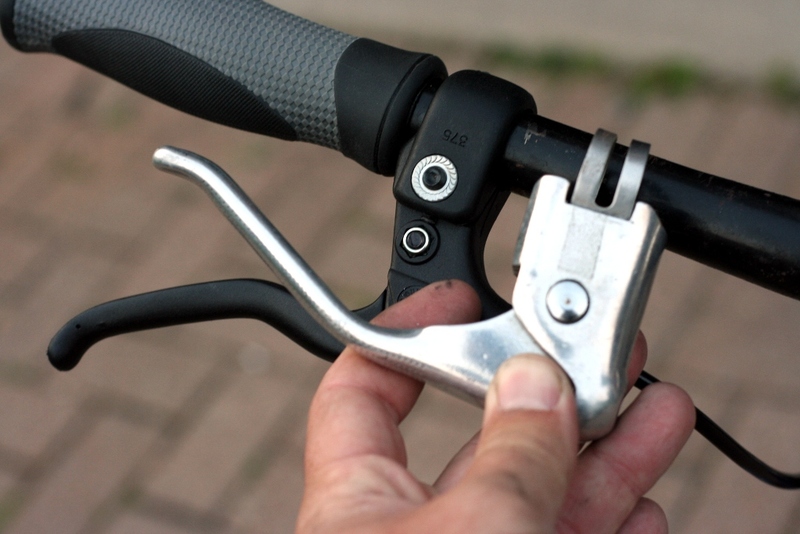 The brake levers needed to be changed to mountain bike style levers. 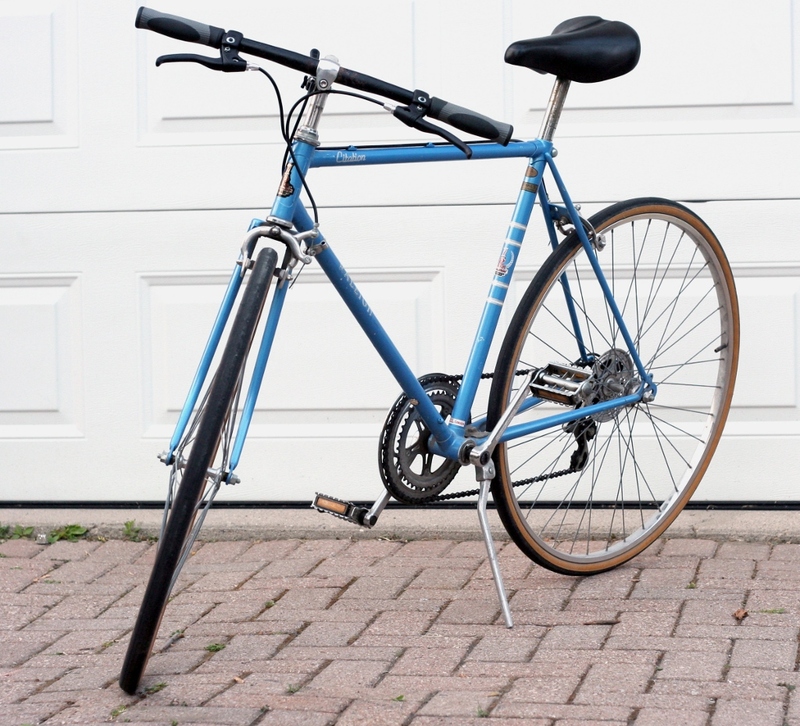 The bend causes the 10 speed lever to bottom out before any braking occurs. While I was at Canadian Tire, I also grabbed some more comfortable grips. I chose the Schwinn/SuperCycle components because I didn’t want to spend more on levers/grips than the original bike cost. So, I’ve got my commuter and since I was already planning to lay down a few bucks for a new bike, I guess that means a new road bike for Rob. A lot of people here who ride similar bikes, they flip the road bike handlebars up…Personally I prefer what you did even though it takes more work. Next time drop by recycle cycles for some parts… most of the used stuff starts at a buck or two so it’s perfect for projects like this. I was just thinking of switching my flat bar for a drop bar. Those are cool looking brakes. I took the suicide brakes off mine almost right away. I didn’t like the responsiveness of steering with my hands so close together. I can understand that. I was always nervous about using drop bars for that reason until I was forced to do so last summer, when there was no other bike available. When the wind’s blowing, it’s sure nice to be able to lower yourself down! Hi, I have the same bike, I’m trying to find out more info on it. Really want to know how old it is. Do you know? 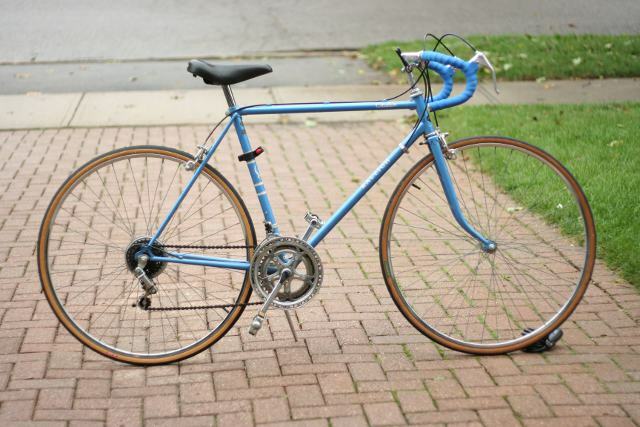 Yeah – How old is Rob’s Raleigh Citation? I can only estimate from the construction. Mine has plastic shift levers which are located on the stem, not the downtube. So I figure it has to be mid to late 80’s, maybe even 90’s. I think bikes before that era had metal shifters located on the downtube. At least, my older bikes all did.